Abrasive cylinder or roller brushes are made with high-quality, heavy density, abrasive Nylon filament and come in standard lengths of 24” (609.6mm), 25” (635mm) and 30” (762mm) and the brush outer diameter ranges from 3.63” (92.2mm) to 5.63” (143mm) and the inner diameter ranges from 1” (25.4mm) to 3” (76.2mm), with a choice of three grit options (240, 320 and 500). 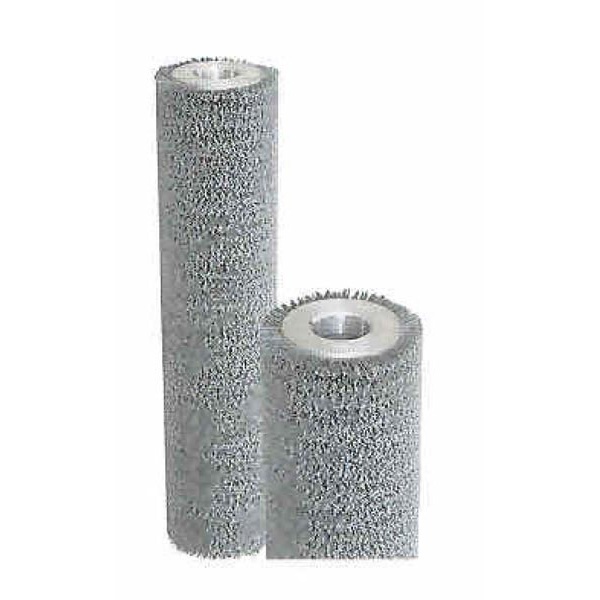 Abrasive cylinder brushes can be used for re-surfacing, even-surface scrubbing, and deburring and features an aluminum core and adapter. A diamond wheel is used to ensure a uniform trim. Abrasive Nylon filament is a synthetic fill material that has excellent abrasion, set, chemical resistance, and bend recovery. It also has good temperature resistance (high melting temperature, high short-term use temperature) and good stiffness, but softens in water. It is FDA approved. The aluminum core and adapter are a soft and non-corrosive metal that has excellent conductivity. These high-quality abrasive nylon brushes are commonly used in the printed circuit and electronics industry as well as many other industries. Gordon Brush® is committed to helping our customers improve their productivity and profitability by providing them with high quality brushes that fulfill their specific requirements, are priced competitively and shipped on time. Our turnaround times set us apart from the rest. Because we're based in the U.S., we can offer same-day shipping on over 3,500 standard brushes. And we can deliver specialty or custom brush quotes at lightning speed — in one business day or less. Gordon Brush Mfg. Co., Inc., is a private company that has a rich history as an American manufacturer of brooms and brushes. Established in 1951, Gordon Brush® includes two brands whose origins date back to 1855 and 1897. All told, the Company manufactures over 17,000 stock, specialty, and custom brushes and brooms, made out of virtually any material including brass brushes, nylon brushes, natural bristle brushes, and more, for industrial and commercial applications and customers world-wide, in its 183,000 sq. ft., state-of-art, ISO 9001:2015 certified, manufacturing facility in the City of Industry, CA. Contact us today for your custom brush manufacturing needs such as medical brushes, ESD brushes, anti-static brushes and more! If we are not already manufacturing a brush to fit your needs, our experienced engineers can custom design, custom make or modify a brush to meet your precise specifications. Whether you need a standard brush or custom made brush, you can count on Gordon Brush® for bigger, better brush ideas. Please contact Gordon Brush® for additional information. If a brush exists, we have it... if it doesn’t, we'll make it. Please call: 323 724-7777, 800 950-7950 or email: [email protected].